A minute later, a second, clarifying email arrived indicating that she “meant boring as a verb not an adjective.” She had spotted the ambiguity in the first message. Ambiguity, as the word itself suggests, arises when words or phrases can be understood in more than one way. It can come from a word with more than one meaning (like “fresh”), from different words that sound and spell alike (like “bow” or “bare”/”bear”), or from words that can be combined in different ways, like “boring spouses.” Many ambiguities are easily resolved by linguistic or social context. The words “with our meeting” mostly disambiguates things in the example above, but until the reader gets to that phrase, “boring” could be read as either a verb or an adjective. Of course, words can be ambiguous even if their part of speech is clear. At a lunchtime presentation, a visiting writer mentioned that he belonged to a bimonthly writers’ collaborative. I stopped listening for a few seconds, pondering whether the group met every two months or every two weeks. I even thought about asking for clarification, but the speaker had already moved on to another point. As writers and speakers, we know what we want to say, so potential ambiguity does not always strike us until later—when we see what we have written or when someone else reads it and points it out to us. When a journalist writes “between two and ten thousand people will be affected,” they almost certainly mean between two thousand and ten thousand. Otherwise, that is a rather useless estimate. Most listeners or readers will not be misled by the phrasing, but some readers will (as I was when I heard that sentence on the radio). As writers and speakers, we are not always as clear as we would like. Pronouns create problems involving ambiguity of reference. A line in the description of the play Off the Rails recently tripped me up: “Captain Angelo orders the Sherriff to arrest Momaday, a young Pawnee boy, for impregnating his love, the Irish orphan Caitlin.” Is the “his” of “his love” Captain Angelo’s or Momaday’s? When you know that the play is a reimagining of Measure for Measure, you can figure out the ambiguity, but without the context or other clues provided by intonation, the sentence may be confusing. Some ambiguities are hard to diagnose even when you spot them. I got an email about a campus retirement event that invited me in large, bold type to COME CELEBRATE THE RETIREMENT OF so-and-so. I knew what was intended, but it seemed to me that the wording could be taken two ways: as an invitation to celebrate someone’s future absence (the good-riddance interpretation) or to celebrate the person’s freedom from labor (the lucky-stiff interpretation). In other words, the phrase “celebrate the retirement of” can be understood from the perspective of the workplace or from the perspective of the retiree. We naturally go for the more polite interpretation, but the other is there, lurking in the corner. As writers and speakers, we are not always as clear as we would like. But as editors and self-editors, we should cultivate an eye for the possibility of multiple meanings that distract and derail our audience. Featured image credit: “Keyboard” by Jeroen BennInk. CC by 2.0 via Flickr. Edwin L. Battistella teaches linguistics and writing at Southern Oregon University in Ashland, where he has served as a dean and as interim provost. 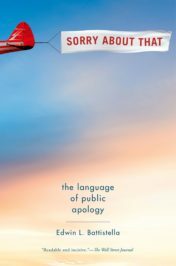 He is the author of Sorry About That: The Language of Public Apology as well as Do You Make These Mistakes in English?, Bad Language, and The Logic of Markedness. If people would consistently use the specific word for every two weeks, “semi-monthly”, then “bimonthly” would cease to be ambiguous. Bimonthly shouldn’t be ambiguous. Bi- consistently means “every two” (or “every other”), e.g biweekly, bimonthly, biennial. Semi- consistently means “every half” (or “twice per”), e.g. semi-monthly, semi-annual.